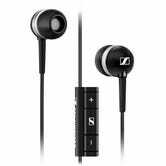 Friendly Notice: Sennheiser MM30G In-Ear Headphone Sale! Amazon has got the Sennheiser MM30G in-ear headphones (with built in controls) on sale right now! I have no idea how long this sale will last, it appears to have popped up some time last night, so my recommendation to you is that if you are in need of some very good in-ear headphones then you should snap these up right away. It might be a one day thing, you guys/gals! As for why you should grab these while you can, first off Sennheiser makes AMAZING headphones. I can't remember ever having checked out their in-ear ones but I know people who swear by their other products. Now it's only fair to warn you that the built-in controls are hit or miss depending on your device. People across various Android related sites have reported that they work perfectly fine on some devices and not at all on others. I suppose you'll have to see for yourself if yours are compatible or not. If you're like me and use Android Wear this is a non-issue though. I'm so used to accepting or rejecting calls and what have you from my wrist that built-in controls on headphones no longer matter to me. Prices will go back to normal, folks. So snag a pair while you can!